The Port of Montreal will be opened up to larger ships after Hydro Quebec raises two sets of power lines that cross the St Lawrence River near Trois Rivières. So this week, we look at the effect that clearances and air draught have on ports and cruise ships. Meanwhile, since last week’s announcement of a ban from November 2014 on mega ships sailing past Venice’s St Mark’s Square, the port has announced that it fears a possible loss of cruise traffic. Finally, Cunard has announced some of the events planned for its 175th Anniversary celebrations in 2015, one of which will be a repeat of the line’s first mail contract voyage from Liverpool to Halifax and Boston in 1840. The Port of Montreal last week announced that Hydro Quebec would raise two power lines above the St. Lawrence River, a move that will allow larger ships to reach Montreal. Following a request by the Montreal Port Authority, Hydro Quebec will tighten power cables next year at Trois-Rivières and Boucherville, providing a clearance of 170 feet under the wires for vessels sailing to Montreal. The power lines were lower in height than the Laviolette Bridge in Trois-Rivières, the lowest insurmountable obstacle on the St. Lawrence River for vessels sailing to Montreal. The bridge has just over 170 feet of clearance under its structure. By comparison, the Lions’ Gate Bridge in Vancouver has a clearance of 200 feet and as built Celebrity Cruises’ Solstice class ships could not sail into that port. However, the Celebrity Solstice is being equipped with a new telescoping mast so that she can call at Vancouver in 2014 instead of Nanaimo, where she called this year. Cutting back on mast height is not something new, however. Back in April 1952, Canadian Pacific’s 30,030-ton Empress of Scotland, which had previously been the Transpacific liner Empress of Japan, sailing out of Vancouver, had her masts cut back by 44 feet in order to reach Montreal. This had to be done in order to extend her own service beyond Quebec to so that all three of Canadian Pacific’s North Atlantic liners turned at Montreal. 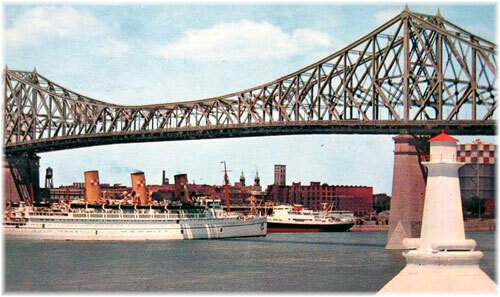 Even in Montreal, however, the air draft of the Jacques Cartier Bridge, at 162 feet, meant that P&O’s original 41,915-ton Oriana had to berth downstream from it when she made her one and only call to Montreal in 1980, and other ships might have to do the same, while Montreal’s cruise terminals are located above the bridge. Of Holland America’s two St Lawrence ships, the Maasdam regularly turns at Montreal while the Veendam now turns at Quebec. But as Montreal has by far the better airline connections, Holland America has been in negotiation with Porter Airlines about direct service between Boston and Quebec to connect with Veendam turnarounds. Meanwhile, there was a time in May 2011 when the Maasdam could not reach Montreal because of high water, meaning that on one cruise she had to turn instead at Quebec while the line coached all of her passengers the 150 miles to and from Montreal. Had there been more air draft available she could have proceeded to Montreal. Elsewhere, the Queen Mary 2 had to be built to a profile that allowed her to slip under the Verrazano Narrows Bridge at New York, where clearance is 228 feet at mean high water she has an even tighter squeeze at San Francisco, however, where the Golden Gate Bridge has a clearance of just 220 feet. With an air draft of 236 feet, the Oasis and Allure of the Seas would need to use their telescoping funnels to allow them get into either port. This they did first when they cleared Denmark’s Great Belt Bridge, opened in 1998, which and has an air draft of 213 feet, on their way from their Finnish builders to Fort Lauderdale. 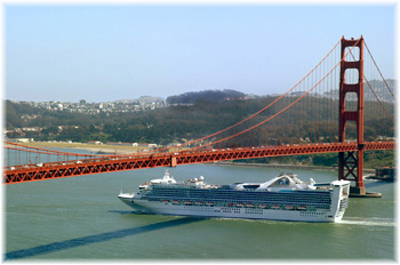 In 1989, after Princess Cruises entered the trade the original 46,087-ton Sky Princess became the largest passenger ship to call at Montreal. Since then, Princess ships have continued to get bigger and now usually turn at Quebec because they have been too tall to reach Montreal. 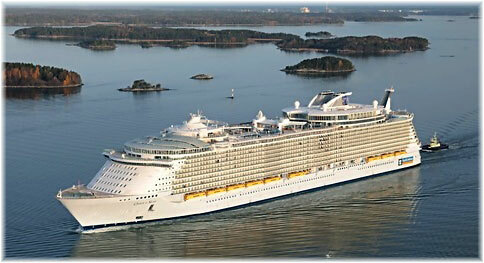 In 1991, Crystal entered the trade and its 48,621-ton Crystal Harmony became the largest cruise ship to reach Montreal. The largest ships to have reached Montreal so far are Aida Cruises 2,050-berth 69,203-ton AidaLuna, which visited in 2011, and her exact sister ship AidaBella, which called there this October. The largest container ship to call at Montreal so far is the 4860 TEU 50,963-ton MSC Carouge, a ship that also carries a few passengers, in 2011. Raising the power lines above the St Lawrence River will allow larger cruise ships, including those in the 3,000- to 4,000-passenger range, to reach Montreal beginning in 2014. But it may still be borderline with some ships. Royal Caribbean International, for instance, had to turn its Brilliance of the Seas at Quebec instead of Montreal in 2002 because of a lack of clearance above Quebec. But even with the higher clearances some modification along the lines of the Celebrity Solstice telescoping masts may be needed as the Brilliance class have an air draft of about 172 feet, still a couple of feet higher than the new St Lawrence River clearance. Last week, in our story “Venice Bans Megaships From Its Lagoon,” we brought the news of plans to ban mega cruise ships from passing St Mark’s Square. Cruise ships presently passing within 1,000 feet of St Mark’s Square grant a stunning view to those on board but their gigantic size can present a rather jarring sight to those actually in the square. A proposed new canal will allow ships to reach the Venice Passenger Terminal from the west, thus avoiding the historic centre. In the meantime, cruise ship traffic passing St Mark’s Square will be reduced by 20%. Last year, 661 cruise ships visited Venice, carrying some 1.78 million passengers. With the opening of the 2014 season,transss of the lagoon by ships above 40,000 tons will be reduced to five a day and from November, ships larger than 96,000 tons will be banned from reaching Venice by the lagoon at all. And according to Sandro Trevisanato, president of the Venice Passenger Terminal, this decision could lead to a potential drop in cruise business and job losses as a result. A lot of effort has gone into developing Venice as a cruise port, with visitor numbers rising from 300,000 in 1997 to last year’s 1.78 million. And Trevisanato is now worried that Venice could lose up to 174 calls and a million passengers with the mega ships. The planned reduction in cruise ships over 40,000gt could mean a further potential loss of forty-eight calls a year, and a further 323,000 passengers. Quoting such figures seems a little alarmist as all ships now calling at Venice will still be able to reach the same berths they call at now, albeit by different routes. And there is no other port on the Adriatic that could effectively compete with Venice. To look at other Italian ports close to famous sites, visitors to Rome, for example, do not sail past St Paul’s, but arrive at a port miles from the city. And Florence is nowhere near the sea. In the case of Venice, passengers who still want to sail down the Giudecca Canal and past St Mark’s Square, a passage that takes only a few minutes, will still be able to do so by booking the right ship. Those under 40,000 tons are fine, and the vast majority of those between 40,000 and 96,000 tons will still be able to do so. The Venice Passenger Terminal seems to feel that it has lost the argument here, claiming that the protests against cruise ships in Venice are based on emotion and aesthetics and pay no attention to research that says that big ships do not pose a risk to the city or the possible erosion of its architecture. 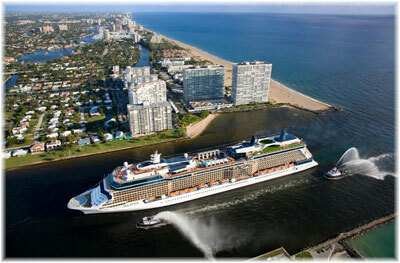 In fact, in terms of the environment, Venice announced the availability of shore power to cruise ships this July. Cold ironing, as it’s called, allows ships to turn off their engines in port and reduces CO2 emissions by more than 30% and nitrogen oxide and particulate emissions by more than 95%. Most observors seem to feel that a happy accommodation has been reached in keeping the mega ships away from St Mark’s Square, but many protesters feel this is not yet enough. With many of the participants in Venice itself disagreeing with each other in a port that has seen a fivefold increase and more in cruise traffic, this situation could yet change again. Cunard Line last week announced two special events in 2015 in its founding city of Liverpool, to mark the line’s 175th anniversary in 2015. To start with, all three Queens, the 148,528-ton Queen Mary 2, 90,901-ton Queen Elizabeth and 90,049-ton Queen Victoria, will rendezvous for the first time on the Mersey on May 25. 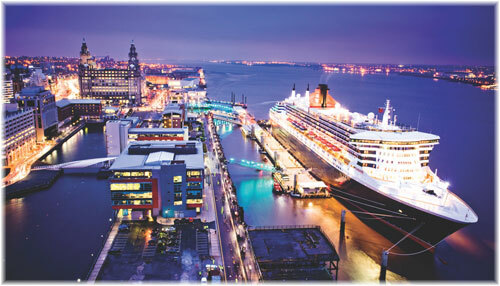 Plans call for the Queen Mary 2 to arrive at Liverpool Cruise Terminal on May 24 for an overnight stay. On the morning of the 25th she will be joined in the river by her fleetmates Queen Elizabeth and Queen Victoria. The three ships will all stand in close to the famous Cunard building on the Pier Head, which served as Cunard Line headquarters for the half century between 1917 and 1967. When the Queen Mary 2 casts off from what was once called the Prince’s Landing Stage, over which passed so many migrants as well as First Class passengers, her place will be taken by one of the sister ships while the other one will remain at anchor to be served by tenders. Then, on July 4, the Queen Mary 2 will sail from Liverpool to recreate the first Transatlantic crossing of the 1,154-ton Britannia from Liverpool to Halifax, which she did in 12 days and 10 hours, and on to Boston. Although New York was not added to the route until 1847, it is now the Queen Mary 2’s base port so she will proceed there after Boston – and yes she has 128 times the tonnage of the Britannia of 1840. When Cunard established the first scheduled passenger and mail steamship service across the Atlantic, the first sailing actually took place on May 16, 1840, when the 648-ton Unicorn left Liverpool with 51 passengers, six weeks ahead of the Britannia. “Hazard’s United States Commercial & Statistical Register” said of the Unicorn: “We learn from Capt Douglas that the Unicorn left Liverpool on the 16th of May, and arrived at Halifax on the first instant, about 10 am, and remained there until 11 o’clock pm. She brought out 27 cabin passengers for Halifax and 24 for Boston; and files of London papers to the 15th of May; Liverpool of the 16th, and Paris of the 13th. The Unicorn is a neatly built and gallant steamer of about 700 tons burthen, and a very fast sailer. The Unicorn was sent out as a feeder ship for the Canadian mails between Quebec and Pictou NS, with connection made to Halifax by stagecoach. She arrived at Quebec on June 29, ready to take up her new duties, carrying the Canadian mails to connect with the Britannia’s first sailing from Halifax and returning with the latest mails from England. This first Transatlantic voyage by the Unicorn is often forgotten as it did not actually take place within the mail contract but was made in order to position the ship to North America. Nevertheless, it was a test voyage for the four new ships then being built for Cunard. The Unicorn’s master, Capt Walter Douglas, had commanded the 605-ton St Lawrence steamer Canada, built at Montreal in 1832, and had surveyed the St Lawrence River for the Canadian Government. Occasionally, between voyages, he would take the Unicorn to the Saguenay River, thus becoming one of the first ships to engage in that trade. Now, nearly every cruise ship that enters the St Lawrence makes the detour to the Saguenay to pass by Capes Trinity and Eternity and to observe the whales feeding at the mouth of the Saguenay where it flows into the St Lawrence. As Cunard did not start its own direct St Lawrence service until 1911, most are not aware of this early St Lawrence feeder service and Cunard’s original participation in the Saguenay cruise trade. But back to modern times, when the Queen Elizabeth 2 first arrived on the Mersey in 1990 to celebrate the line’s 150th Anniversary more than a million spectators turned out to see her and the fifteen visits since by Cunard Queens have always received warm and enthusiastic welcomes. The City of Liverpool has meanwhile bought the Cunard Building for use as council offices and Cunard Line’s original First Class reception areas in the lower level will be brought back into service as a cruise reception area for future callers, something that will add a real authenticity for Liverpool-boarding passengers.